Travel package of 5 days to make the W circuit in Torres del Paine National Park. 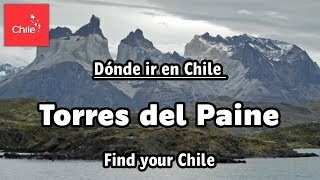 On this trekking you will visit the best places of the park like Grey glacier, Pehoé lake, Nordenskjöld lake and Base Torres, where you will see Paine´s horn, all accompanied by a tour guide and a group of other travelers just like you. At 11:30 AM your guide will be waiting for you in the commercial office of Fantástico Sur (Esmeralda 661, Puerto Natales), to give you a technical talk and meet the group that will travel together. Later, at 2:00 pm, we will meet at the Puerto Natales rodoviario to take the bus that will take us to the Laguna Amarga port, where we will complete the entrance process. A transfer will take us to the welcome center located in the sector of Estancia Cerro Paine. There we will have dinner and sleep in camping. We will have an early breakfast and leavefor one of the most emblematic places of the park: the Base Torres viewpoint. This is one of the most difficult trails in the park but the reward makes it worth it. During the first part we will walk through the pampa and cross the Ascencio River, after which we will climb about 3 kms to reach the Paso de los Vientos, where we will have incredible views of the valley and lakes.We will continue until we reach the Chilean Refuge, and then we will enter a lenga forest and arrive at La Morrena, where the hardest part of the trekking begins. We will walk along a rocky path until we reach the spectacular Mirador Base Torres. After a well-deserved rest in the viewpoint, enjoying the lunch, we will begin to descend towards the Central Sector to have dinner and camp. The walk lasts between 8 and 10 hours depending on the pace of the group, traveling 19.5 kms in total. This day will be less demanding since we will walk less kilometers and with lower altitude difference. After breakfast we will walk around 13.5 km bordering the Nordenskjöld lake, the Almirante Nieto hill and the impressive Cuernos del Paine. During the trip we will have beautiful views of these hanging glaciers, lakes and ideal areas to appreciate the abundant flora and fauna of the park. We will stay at the campsite El Francés. After breakfast we will start with a gentle walk until we reach the Italian Camp. From there we will start the ascent (about two kilometers) between forests through the valley of the French river. We will continue until we reach the French viewpoint, in a rocky road, from where we can have one of the most breathtaking images of the circuit: the view towards the valley flanked by the Paine Grande hills, Cathedral, Leaf, Mask, Sword, Shark Fin and Northern Horn. To be without words. After that show, we will begin our descent towards the camping in Paine Grande. The walk in total is 20.5 kms of high difficulty, especially because of the unevenness at the end of the trail, and we will travel it in a time of 8 to 10 hours depending on the pace. Our last day starts with a good breakfast to walk early to the Refugio Gray. We will begin bordering the Paine Grande hill, the highest point of the Massif (3050 m), with incredible views towards its hanging glaciers. Walking among ñirres, coigües and notros, we will reach the first viewpoint of the Gray Glacier, where we will see numerous pieces of glacier floating in the lake of the same name. We will continue walking with the imposing view of the Gray glacier, until arriving at the Gray Refuge from where we will be able to see it from the front. We will have lunch and return to the Paine Grande sector to take the catamaran at 6:30 p.m., which will take us to Pudeto. There we will wait for the bus that will take us back to Puerto Natales, where we will say goodbye. If your program starts at 14:30 hrs. you must go to the Fantástico Sur office (Esmeralda 661, Puerto Natales) the day before, or the day the program starts before 13:00 hrs., to receive your voucher, map and a talk about the circuit. Their offices are open from Monday to Saturday, from 9 AM. If you want to acquire a bus ticket from Punta Arenas to Puerto Natales, ask for it at reservation for an additional charge. Take two back-packs: one of 40 liters for the circuit, and one from 20 to 25 liters for day hikes. In addition, we suggest you wear thermal clothes and shoes, and a raincoat, that are comfortable to walk, besides short-sleeved and long-sleeved t-shirts. We also recommend taking sandals, towels and a bathing suit, as well as batteries, flashlight, lock, sunscreen, sunglasses, water bottle, bags and trekking poles. Do you want to know how to get to Antarctica? Then we will tell you everything about the trip to the coldest continent in the world. These are the things that a sustainable tourist should do. This is our selection of the best Instagram accounts on landscapes and flora and fauna of Chile. From north to south Chile is characterized by its high snowy summits and volcanoes that give life to the famous Andes mountain range.